Very simply, the demonstrations erupted after price increases. It is hard to live with unremitting foreign hostility, as the socialist bloc learned, with only tiny Cuba surviving the Cold War. Venezuela dared to buck the neoliberal order and has suffered terribly. The current unrest can be laid at imperialism’s feet. An outbreak of bird flu in Iran was a kind of finishing touch, as egg prices jumped 30%. Turkey rushed truckloads of eggs to the rescue, but Nature had done its work. Another spark was an increase in the price of gas. Since the demos began, parliament has addressed the problems and adjusted prices, though clearly the issue will not go away. I was the guest of Tehran-based New Horizon, holding book launches of The Canada Israel Nexus in the Persian translation in Tehran, Qom and Esfahan, as rumours from BBC et al filtered through. My hosts Reza Montazami and Hamed Ghashghavi were furious at the distortion of actual events. “They used old stock footage of past demos not even from the same town,” Hamed fumed. The greater freedom of publishing and demonstrating in Iran is ignored in the West, but is now an accepted feature of a critical, well-educated broad population. Iranian Supreme Leader Ayatollah Ali Khamenei said that people have genuine grievances that should be addressed by the government, but blamed foreign powers for contributing to the unrest. Indeed, foreign embassy staff and foreign journalists were participants in protests that hit Iran in late December. The refusal of Trump to make any accommodation to Iran on the nuclear agreement and to ease sanctions is proof that the economic war against Iran continues. The situation was eerily like my visits to the Soviet Union in the 1980s, when there was arguably much more freedom of thought and expression at the time than in the West. The great danger in opening up society to more spontaneous criticism, of course, is that your enemies jump at the chance of hijacking the protests, as indeed happened then and this time. Mujahiden-e khalq, as a native terrorist organization, is still active. According to a 2009 report published by the Brookings Institution, the organization has no mass following, and merely acts as a proxy against Tehran. It is designated as a terrorist organization by Iran and Iraq, and was considered a terrorist organization by the UK and the European Union until 2008 and 2009 respectively, and by Canada and the United States until 2012, when it suddenly became peaceful, using the logic ‘the enemy of our enemy is our friend.’ They are still active and far from peaceful. The slogans for an end to corruption and a curb on inflation were turned into calls to overthrow the government, though this quickly became a source of intra-demo conflict, resulting in counter-demonstrations in support of the government. During my visit, I saw only a large police presence in Esfahan, but no demonstrators. 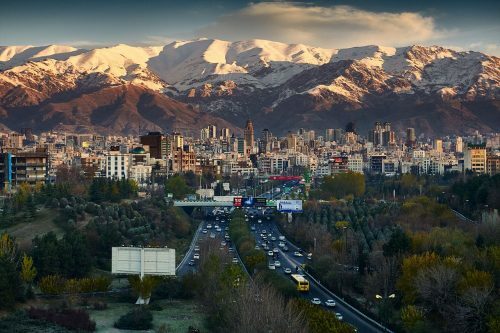 In Tehran and Qom, there was no evidence of protests, the demonstrations limited to the University of Tehran and the dormitories nearby. No one showed any fear of speaking his/her mind, and only a handful of provocateurs called for the overthrow of the government. Though I was treated hospitably by all, those in the know were angry about the Canadian government’s unwillingness to move ahead to reestablish diplomatic relations with Iran, broken unprovoked in 2012 under Harper. Justin Trudeau does only what Washington allows, and vague promises to improve relations have not been acted on. Special anger against Canada is caused by Canada harbouring the Iranian banker Mahmoud Reza Khavari, a dual Canadian-Iranian citizen. He resigned as chairman of Iran’s state-owned Bank Melli, a bank blacklisted by the West, accused of $2.6-billion embezzlement in 2011. He fled as a Canadian citizen, and upon arrival in Canada, he paid off the mortgage on a $3-million Toronto home and gave it for a token $2 to his daughter, Parandis Khavari. Khavari was sentenced to 30 years in jail by Iranian courts, but there is no movement on Iran’s request to extradite him via the International Criminal Police Organization (Interpol). On the contrary, efforts are being made to grant him immunity for revealing his many ‘secrets’. Clearly, Iran needs a healthy dose of socialism, in line with Iranian thinkers such as Shariati. Sharia calls for sharing wealth. So far, the government has shown bad PR skills, much like the ill-fated Soviet leaders. Both societies were/are anti-imperialist and suffered because of that. Both had/have a well-educated intelligentsia. But Iran has an ace up its sleeve: Islam. The baby will not disappear with the bathwater. This article was posted on Wednesday, February 7th, 2018 at 8:00pm and is filed under Canada, Canadian hypocrisy, Cuba, Iran, United States, Venezuela.